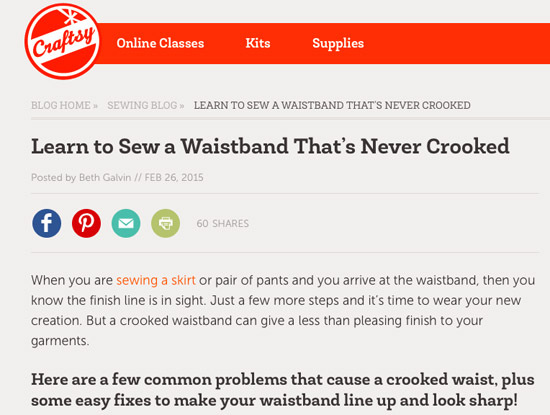 To my surprise I have not seen one green item in my reading of sewing blogs today. I suppose St. Patrick's day is considered another goofy holiday and excuse to drink beer but with my heritage it is the real deal. Having visited the farm in Ireland where my grandfather was born (which is still in the family) I can attest to the fact that you have not seen green until you have been to Ireland. Dazzling in hue and variation. So that means I will wear something green and here is this year's item. I got this knit fabric at a Bay Area sewing meet-up fabric swap earlier this year and figured it would be good for trying out a t-shirt or something. 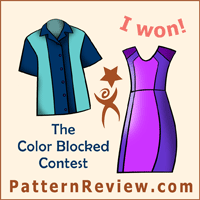 But last week I had the idea to make a regular collared shirt - but in knit instead of woven. Here it is, and while it has a few quirks I am quite happy with the result - super comfortable and I love the color. OK first off let's just note that there are no buttons down the front. Yes. I took the easy way out. 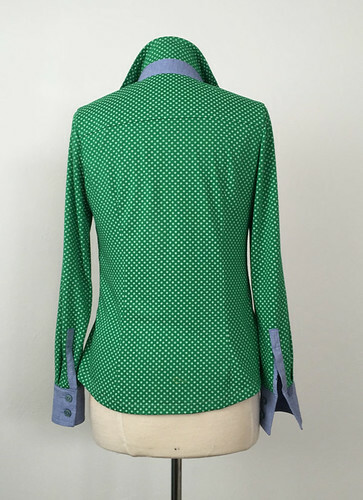 I had made it with a placket front, and then in the trying on and fitting process, when I was pinning the front together I had a minor revelation - knit shirt - no fastenings needed! I can pull it over my head. So I just sewed it together in the front, overlapping as if it were buttoned. So lazy and yet it worked out fine. 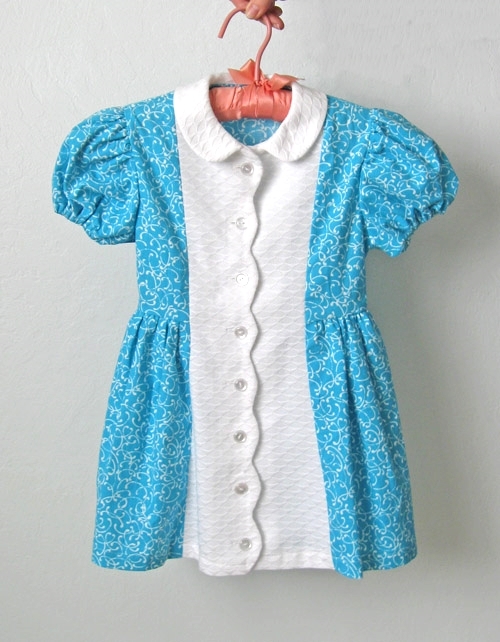 I may just sew up another of these knit-y shirts. Also I forgot to put interfacing in the placket and buttonholes + knit fabric with no stabilization = very unsightly buttonholes. Maybe I should sew on some buttons but I think why bother? 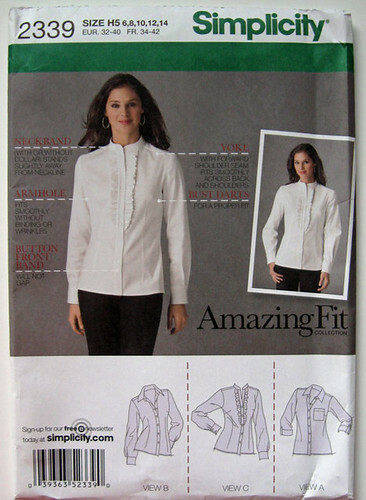 In fact the next one may have a placket at the neck like a tunic top. What pattern? 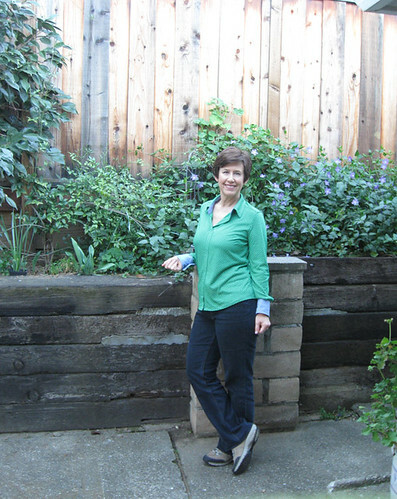 My trusty Simplicity 2339 Amazing fit shirt, which I have made 3 times before, flannel version, cotton voile version, silk charmeuse version. How's that for versatility? And this has to be one of the most hideous pattern envelope versions. Fine, let's just stipulate that most pattern envelope photos are terrible. The ones that are good looking are actually the minority. My suggestion - LOOK past the styling - study the technical drawings. I was just talking about this over the past weekend. That probably people who are newer to sewing do use the photo of the actual garment to base their choices on, whether for good or bad. 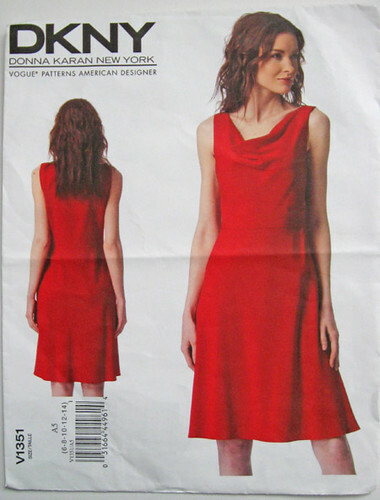 I try to ignore (or scoff at) the photos, whether indie or Big 4/Burda and just use the drawings to decide on a pattern. Back view. I did do quite extensive fitting alterations once I had the side seams basted together, realizing it was way too big for a knit shirt (but works fine for a non-stretch flannel). So I took it in about 2 inches on each side seam, narrowed the sleeve by 2 inches, and moved the shoulder seam in about 3/8". Now that it is done I am not 100% happy with the bust dart placement, could maybe be a little lower but whatever, I can live with it. 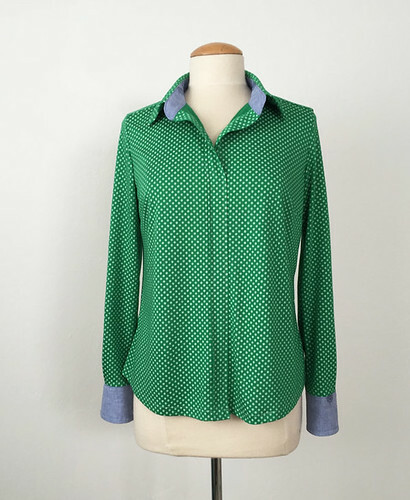 I used a lightweight cotton for the cuffs and collar stand as I always see these cute shirts with mixed prints or accent fabrics and wanted to try it out. Making those sleeve plackets is not that bad, it's like buttonholes or zippers, once you do it a few times it goes really quick. And as you can see I could probably narrow the cuffs for my smallish wrists but I just move the buttons to where it fits better. Note to self, the sleeves are a bit long and I still haven't shortened the pattern. Probably because of my extra short arms I am used to all sleeves being too long and never even think about it. Duh! Spring is well and truly here in Northern California - not that winter ever fully arrived. Thank you for all the nice comments on my last jacket project, I appreciate it and while I am very happy with that pattern it is going in the closet until November or so. No way I would have any opportunity to wear it as our temps are hitting the 80's (F) this weekend so I am breaking out the shorts. Once again I apologize to you in the snow zone - but when you have a lush green summer and we are parched and scorching then the tables will be turned. Speaking of summer sewing - I bought some new fabrics recently. Which may seem a typical thing to say but not for me as I hardly ever buy fabric in a store lately. It seems I have found about 75% of my fabrics at garage sales or sewing swaps. To tell the truth I just bought some this morning, some turquoise blouse weight linen and a two tone cotton, both destined for shirts, investment four dollars. Also I have been looking through my patterns and deciding what to make. This past year was all about pattern repeats but I want to crack open a few that I bought with full intention to sew and haven't. 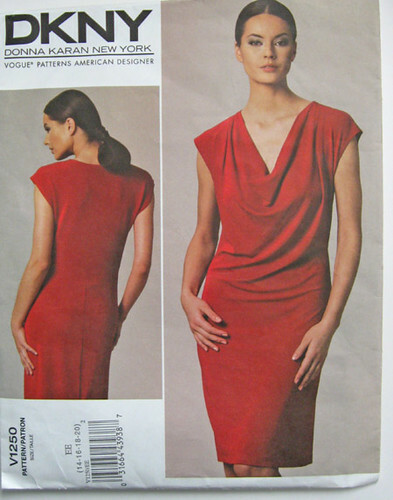 Plus I need to talk about my abiding pattern obsession - which is any Vogue pattern by Donna Karan. It is so strange as I don't really get any charge out of her collections when I see them. Probably due to the use of black, earth tones, a lot of oversized items. They just look too New York for this west coast life. But the shapes are often so flattering on a female body and that is the beauty of sewing, picking the fabric and color that suits you personally. So here is a collection of my DK patterns and some thoughts on what I might make next. First up: these are two I plan to make this spring. The one on the left, V1220 was picked up at a pattern swap at a Bay Area Sewists meet up - my friend Laura Mae dragged me over the the table and said "you have to take this pattern, it looks good on everyone who makes it" OK I was sold. 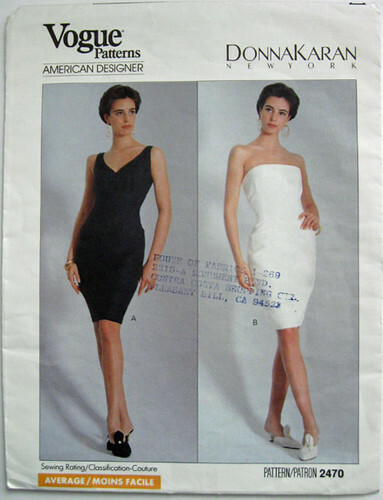 The one on the right, V1236 seems such a simple yet easy silhouette to wear, and uses almost no fabric so I will give that a try as I live in shift dresses when the temps go over 100F. And now two patterns that I have had for a while - never purchased them as new but got them for free at other swaps. They always were on my "I wish" list but due to my miserly tendencies hadn't bought them at retail. But free - can't resist. I like them both and have seen seen nice versions on the web, particularly the V1087 on the left. (checkout this version). I almost started the one on the right last summer, V1281 but kind of ran out of time so didn't get that made. (But again Carolyn did, in a completely unique version). Sometimes these Karan patterns start to seem a bit similar, as these two look kind of alike on the envelope but are not at all. The one on the left, V1287 I made for myself back in 2012 and have only worn it twice. 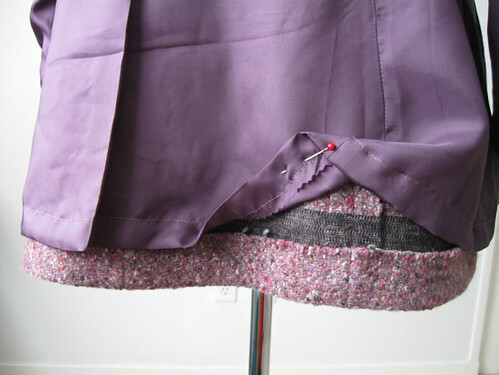 It is just too much drapey fabric on my, I probably should have sized down and maybe taken out some fullness. So not a winner. Although I like the skirt design with the drapey (droopy?) pockets. The one on the right, V1159 was much better. 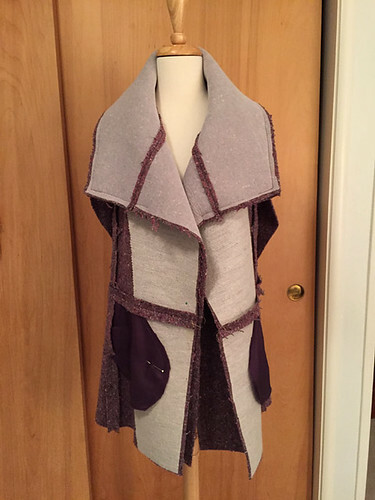 I made this for a friend and while the pattern has some issues (gapey armhole problem that everyone encountered) it is very glamorous and I was really happy with the result. Here is the link to that dress's blogpost. 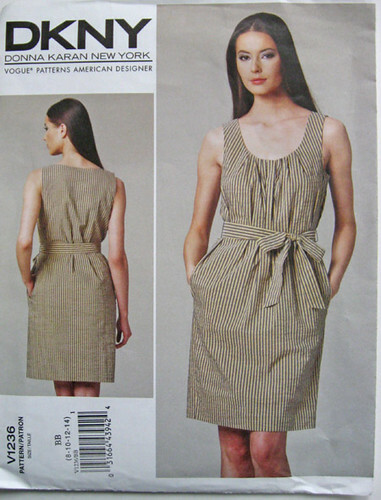 I also did a post comparing this pattern to a Vogue Michael Kors dress pattern as they are similar in idea, and that is one of the most read posts here on my blog. What's left in my DK Vogue pattern stash? This one qualified for my designation of "Pattern Love" which I don't hand out lightly. And I hate the version on the envelope. I don't even like cowl necklines as a rule. But this dress is SO well designed, sews up beautifully. Can be made in a knit or a woven. I have made it 4 times, my first version here and then a couple more times for a friend. Some honorable mentions - this one below V1250 doesn't appeal to me but I made it for a friend and it looked great on her. I think if you have a fuller upper body and slim lower - which some women do - then this dress looks very flattering. If you lean more towards the full hip and smaller bust then the pattern above (V1351) gives a similar cowl effect but might be better. 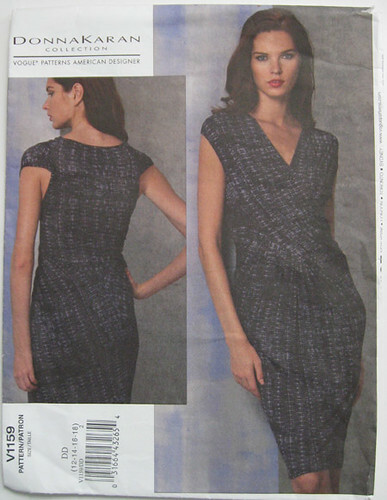 The V1250 is maybe one of the easiest dress patterns I have ever sewn, Vogue or otherwise. 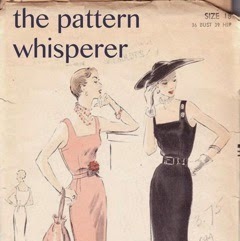 And my Donna obsession goes way back, as this one below is my most treasured pattern. 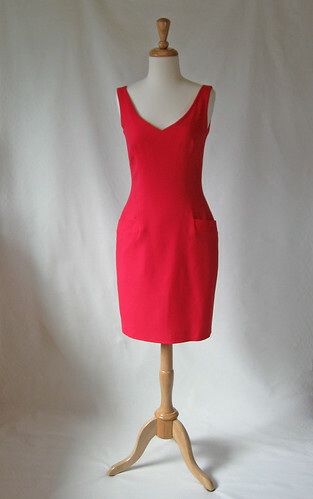 Just a simple sheath dress but somehow perfect for me. 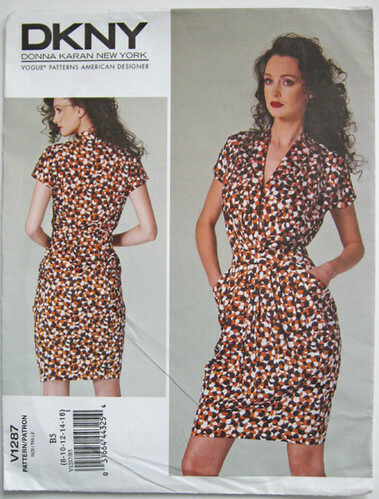 The copyright date on my pattern says 1990. This dress is a keeper - truth be told a bit snug now but I will never get rid of it. 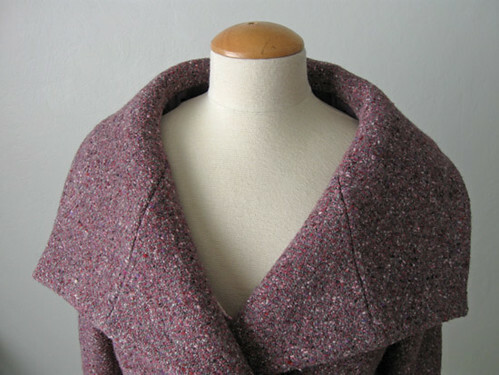 Wore it a zillion times, made with coral wool crepe and has held up beautifully. 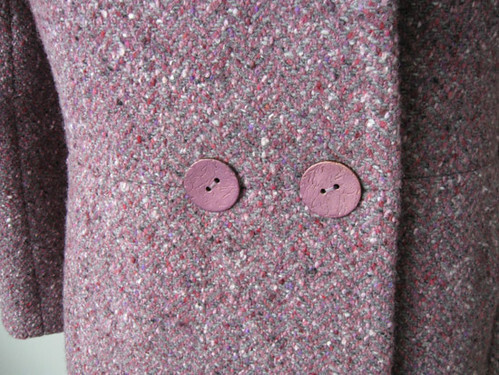 I think wool crepe is a perfect dress fabric as it shapes beautifully, the colors are fantastic and holds up to wear. So those are my DK pattern obsessions, the strange thing is I have not bought any of the most recent releases for maybe 18 months? If history is any guide I will be snapping them up later at a swap or trade. What about all that fabric I bought? Here is a quick rundown. First a purchase from Girl Charlee. 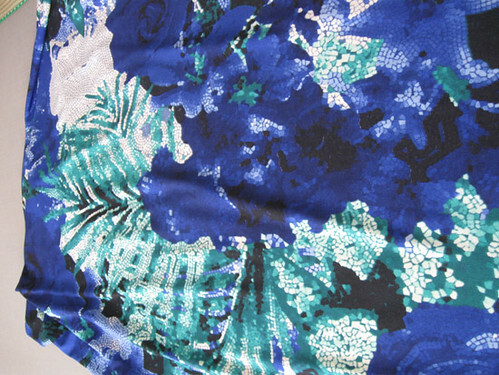 They have so many fabrics I like but this cherry blossom blue knit print has caught my eye for many months. The pineapple print denim is a bit goofy but I showed it to my mom as I thought it would make a cute little denim jacket for her. So I ordered 4 yards. I may end up with some wacky shorts as well. A few more. The dot/stripe knit I got at a fabric swap, and will make a cute summer t-shirt. 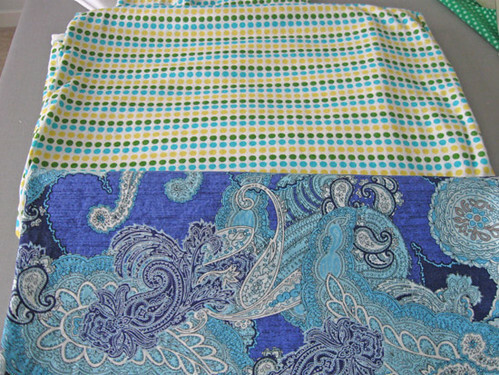 The paisley blue cotton print I bought at Joann fabrics this week, along with the blue mosaic floral print ITY on the right. The paisley print for a button front shirt and the ITY jersey for a wrap dress which may look slightly polyester and/or geriatric but I will give it a try. 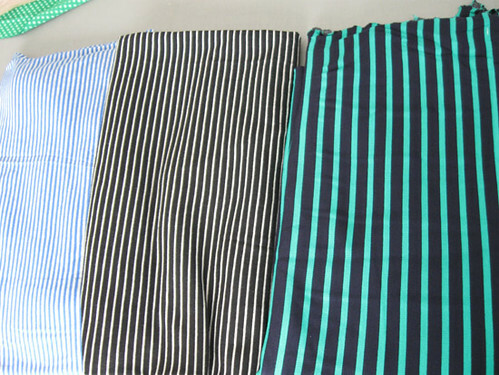 Some stripes - the light blue and the black/white I got at a fabric swap, good for t-shirts. The Navy blue with kelly green stripes is another actual purchase ! 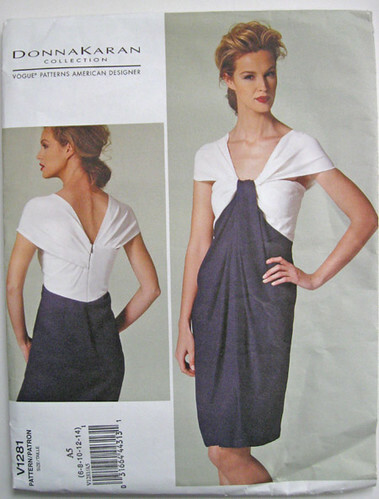 which I bought at Stone Mountain, for another version of the shingle dress Vogue 8904 which I wore a lot last summer. So as usual a heavy dose of blue in all forms in my sewing queue. However I am working on something green for St. Patrick's day, a long standing tradition in my very Irish half of my family. 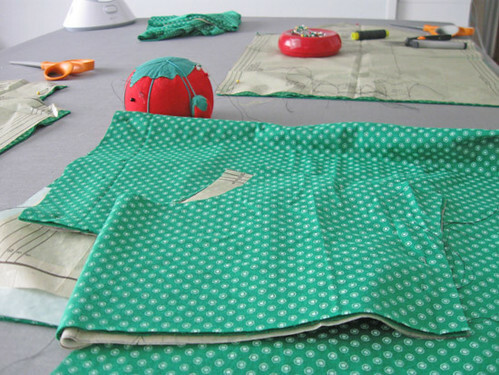 Happy weekend sewing and I hope the leprechauns don't hide your scissors as they sometimes do to me! 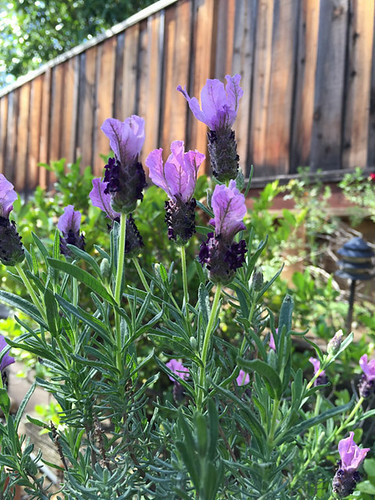 Today's garden photo, the Spanish lavender seems to have bloomed overnight and I can't get enough of these gorgeous colors, purple and green are perfect together. 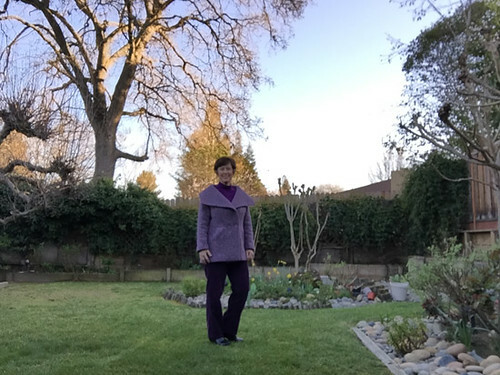 The calendar still says winter but it feels like spring around here - and yet I have just completed one of the warmest garments I have ever sewn. This pattern grabbed me the moment I saw it despite the fact I have no need for another coat. I had this piece of wool bought at Stone Mountain about a year ago so I decided to give it a try. 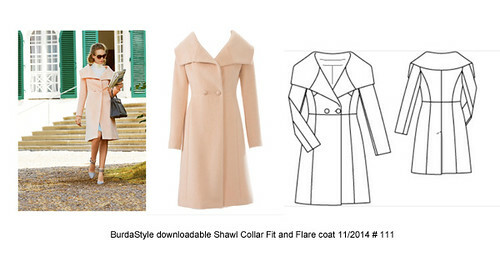 Note I bought the PDF pattern download from the BurdaStyle website, not the magazine pattern. And I really wanted to make a full length coat but once I started cutting out I realized I had nowhere near enough fabric so it became a jacket not a coat. To compound that, I was this close to making a very major mistake - totally forgetting to cut out the facings. At least until I did my usual step back and do a little mental origami. I run through all the pieces on the table and "construct" the item in my head - and that is when I realized I had not planned to cut out the facings, which definitely show on this design. Whew! I didn't make any changes in the pattern - actually sewed it just as is. Oops one change, it had buttonholes marked about an inch above the waist seam but I decided it was a perfect design to make the in seam buttonholes, as I did on this other Burda jacket. Can you believe I found these buttons at Joanns? I just went in there thinking I might find something so I could finish it and maybe get better ones later but these are just right. Interfacing on upper and under collar, plus all the way down the front. 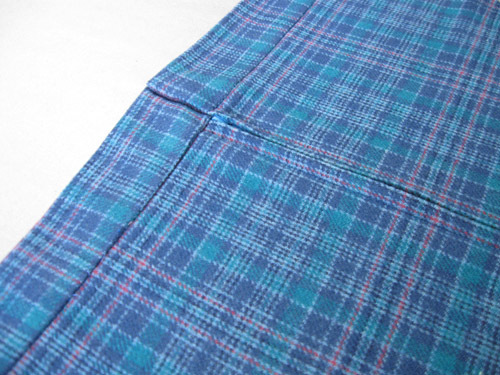 I also catch-stitched down those seams where the collar joins the coat so it would stay flat. 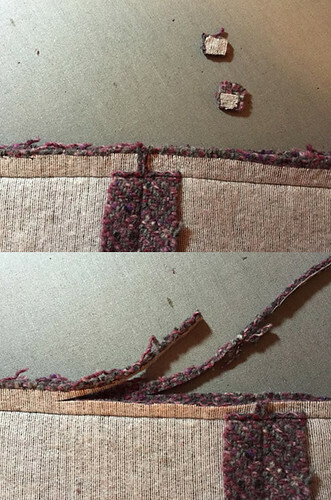 This fabric was so thick and springy, it really needed a lot of trimming and grading. It was about 70 degrees this afternoon and I ran outside and took a pretty terrible iPhone timer photo so you can see how it looks on and how the collar falls. 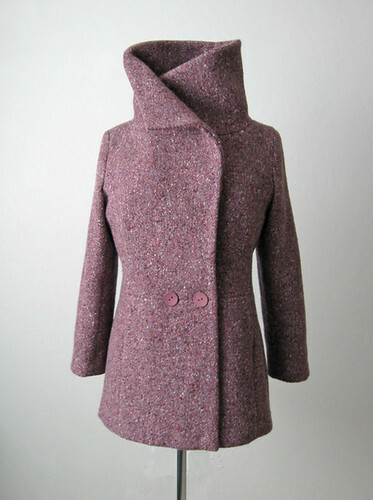 I think this will get plenty of wear next fall but for now it being put away in the closet with the other winter stuff! my apologies to everyone in the snow zone. The lining is ambiance rayon. One thing I might need to change is to add something onto the hem edge, I should have put a seam finish there because it is raveling a bit. As you can see, I didn't sew the lining to the hem, kind of not the typical but I like a lining to be loose from the jacket or coat bottom, once in a while I attach it but mostly I don't. 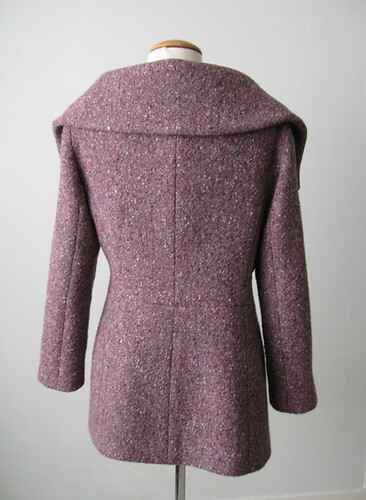 One last look at the coat with the collar up. 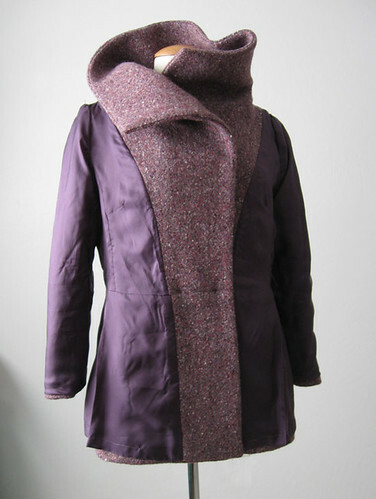 When I first posted the coat muslin I think there was a comment that it was a Fashion coat as opposed to a Winter coat. 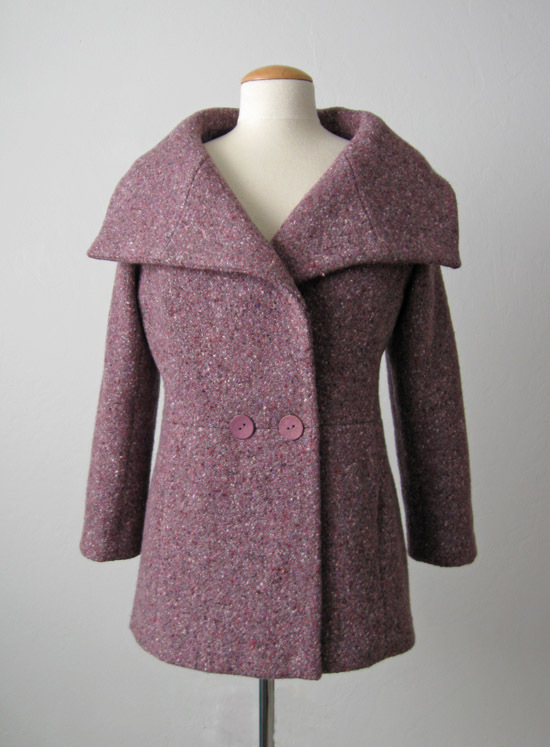 But I think it could be a very warm coat and you could easily put another button or other closure at the top. It is a very easy pattern and perfect for a beginner. So onto the next projects which might be pants, I really want to make some crazy print pants for spring. 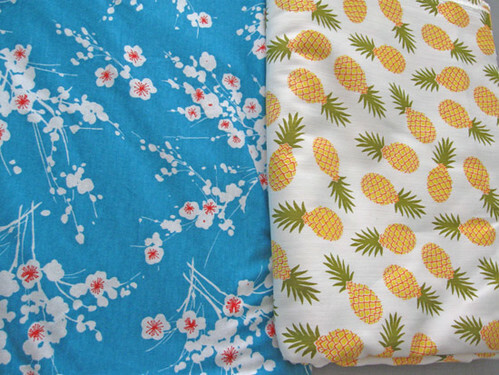 And just ordered some pineapple print denim from Girl Charlee. Summer is coming !!! 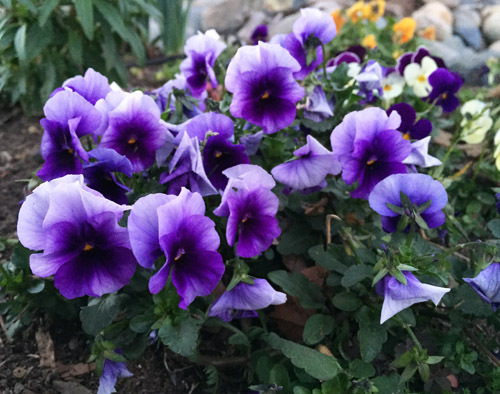 and something in the purple range for today's garden photo, violas in violet. 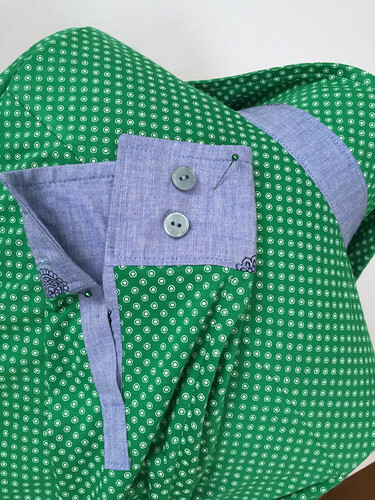 It seems I am not the only one who doesn't like to sew buttons - based on the previous post's comments there are plenty of you who are with me on that one. Give me a nice zipper closure anyway. Although separating zippers - I find those a bit of trouble also. Oh well, unless I am going to sew myself into my clothes as they sometimes do on Project Runway I will have to deal with all manner of closures, whether buttons, snaps, zippers or whatever other interesting details I can think of. (my friends Shams and Jean are both brilliant at coming up with interesting closures, and masters of the separating zipper on jackets). This one was very dear to my heart - it really bugs me to see the waistband not lapping properly at the top of a zipper - check it out to see examples, what to look for and how to fix. 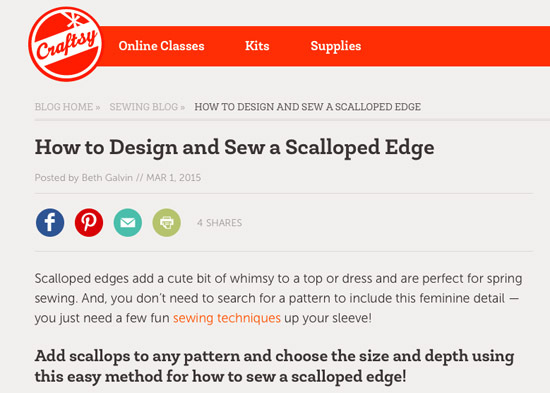 And one that I always think is nice for spring/summer sewing: How to create a scalloped edge. You don't need to look for a pattern that already has this detail, you can customize any pattern. Using "tools" from the kitchen. What? Check out the post and see. and a little daffodil sunshine for you. 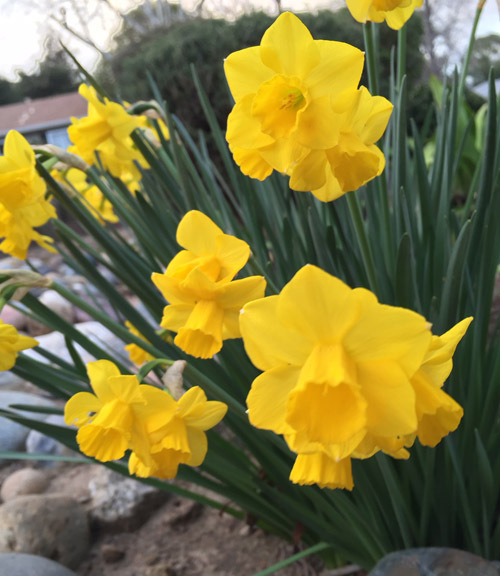 I love daffodils, they naturalize, they multiply, they reliably pop up year after year. A perfect addition to the garden!